The most successful teams use their data to make the best decisions. We built Dataclips to allow your team to better share, reason about, and ask questions of the data you keep in Heroku Postgres. Heroku Dataclips are a lightweight data sharing tool that lets you take advantage of your organization’s most valuable asset. Dataclips were inspired by a set of collaboration tools we love like Google Docs and GitHub’s gists. We use tools like these every day to share everything from drafts of blog posts to snippets of code. The problem was that when we used them to share data it became stale the moment we hit the "paste" button. Even worse, when we’d go back to refresh that data often the queries that created it had been lost. Everyone in every role in every organization I’ve ever met has experienced this problem, and that’s why we’re delighted to announce that today the new version of Heroku Dataclips is generally available. 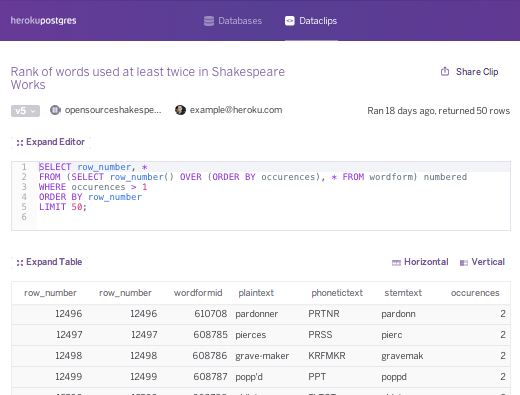 A Dataclip is a secret URL that holds the results of a SQL query on a particular Heroku Postgres database. Given the unique, private URL for a query, a user can call up the most recently stored results of that query. Our system will automatically re-run the Dataclip from time to time in order to keep results fresh. By sharing a Dataclip URL the same way you would share the underlying data, any recipient can view that data within, download it as a CSV, or even embed it live into a tool like Google Sheets. We absolutely love seeing how our users have adopted Dataclips, and the work we’ve done on the redesign we’re launching today is the product of feedback from a great many users. We’ve introduced all kinds of polish, including full page editing, full page results, and the ability to toggle between horizontal and vertical listings. We’ve also focused on performance, because fast is a feature everyone can appreciate, and added a new look that matches the beautiful Heroku Dashboard design that was released in August. We’ve observed that data literacy is a hallmark of healthy organizations. That’s why more than just sharing the results, Dataclips is a tool for helping a team learn how to ask the right questions. When a member of a team can use data to drive a decision, they make better choices. In addition to sharing Dataclip URLs within your team, the Dataclips home page will let you browse the Dataclips associated with databases you have access to. It includes a blazingly fast search that works no matter whether you remember a word from the title of the clip or the creator of it, and it continues to perform whether you have five clips or five hundred. Every Dataclip includes the query that produced the clip as well as its results. This means that anyone on the team can look at the query and let it inspire their own questions. This led us to add the ability to "fork" a Dataclip as well as editing it in place. A fork of a Dataclip copies the clip to a new URL where it can be edited to find new results and shared again. By starting with queries written by more experienced authors (and by using features like Postgres’ WITH expressions to write readable queries) the ability to not just retrieve but also to explore data spreads through a team. As with gists, the primary way to reach a Dataclip is through its URL, and you should treat the URL as being equivalent to the data inside it. However, we know that some data is more sensitive than others, and that’s why we’ve also included security tools that allow you to restrict access and define exactly which users are allowed to access that Dataclip. Data sitting quietly in a database doesn’t do any good for anyone. That’s why we added Dataclips into every Heroku Postgres database and rebuilt Dataclips based on your feedback to be faster, easier to use, and better integrated with the Heroku dashboard. The most important data your team has can be at your fingertips at all times by adopting Dataclips today. No matter whether you’re tracking sign-ups, in-app behaviour, revenue, or all three you can use Dataclips to keep a live view into the performance of your application. Why not make a Dataclip right now?